HP Police Constable (Male/Female) Result / Scorecard 2017 Declared - Himachal Pradesh Police Department 1073 Constable Interview Admit Card 2017 Call Letter - www.hppolice.nic.in. The good news is that HP Police has declared the result of written test held on 02nd October 2017 at various exam centres. The roll number result of HP Police Constable can be downloaded here in which application ID, roll number, name, DOB, sub-category & marks are mentioned. About 4540 candidates have qualified the examination and may be invited to attend the interview. The date of interview will be intimated soon. 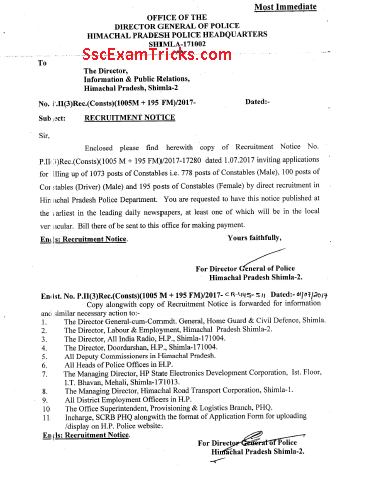 Himachal Pradesh Police Department has released notification Constable and invited applications from 01st July to 21th July 2017 at www.hppolice.nic.in. 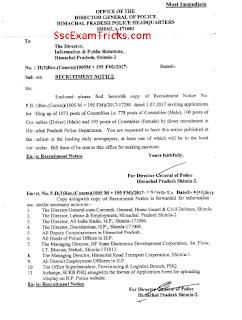 Interested and eligible candidates can download the notification and can apply offline for this recruitment before the last date.